The aircraft, which Moscow will swap for beef and wheat, would be able to mount air patrols over Port Stanley. Ministry of Defence officials fear Buenos Aires would take delivery of the planes well before the deployment in 2020 of the Navy’s 65,000-tonne aircraft carrier HMS Queen Elizabeth and its F-35B fighters, leaving a “real window of vulnerability”. Defence cuts have left the Falklands with just four RAF Typhoon fighters, Rapier surface-to-air missiles and fewer than 1,200 troops, supported by a naval warship that visits throughout the year. President Putin’s visit to Argentina in July laid the groundwork for exchanging Russian military hardware for wheat, beef and other goods Moscow needs due to EU food embargoes. The deal involves a lease/lend of 12 Sukhoi Su-24 supersonic, all-weather attack aircraft. They are ageing but Nato still regards what it codenames “Fencers” as “super-fighters”, with their 2,000-mile range and laser-guided missiles. via Falkland Islands defence review after military deal between Russia and Argentina | UK | News | Daily Express. 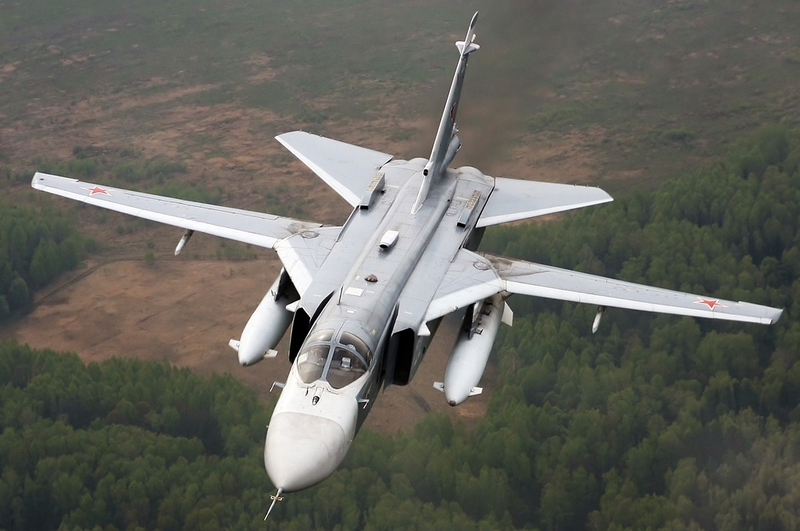 NATO hardly considers the Su-24 a “superfighter” but it does consider it a very respectable long range strike platform. We’ve opined that Argentina’s only chance to seize the Falklands again lies in a coup de main attack that renders the runways of the Falklands unservicable for a considerable length of time. The Su-24 is quite capable of such a mission. It has the range and payload capacity to fly, approach under the radar, and strike with very little warning. Further, depending on what munitions Russia includes with the transfer of the bombers, it could also pose a very significant threat to the destroyer or frigate that the Royal Navy keeps on station. Whether Argentina will attempt such an attack is hard to tell. Mustering public support would be difficult. And any such attack would have to include large scale landings to actually control the islands. The land forces now stationed in the Falklands are very much more capable than the two platoons of Royal Marines that were there in 1982. At the same time, Argentina’s ability to conduct large scale landings has greatly diminished. Further, there’s a much greater likelihood that this time around, Great Britain would resorts to strikes against the Argentinian mainland. One would hardly be surprised if Britain’s response to Argentinian aggression included a sub launched Tomahawk through the front door of Casa Rosada, the Argentinian presidential mansion. Finally, it is hard to see this as anything less than Putin responding to Western support for Ukraine and Baltic states. You play in my back yard, I’ll play in yours. H/T to Spill for pointing out the article to me. Also, with the last of the QF-4s being converted recently, it’s time for the QF-16 to serve as the target of choice. Pretty quickly in doing research on the recently increased tensions between Argentina and Great Britain, I realized one of the biggest problems Argentina would have in any notional conflict would simply be getting to the islands. Getting ashore would just be the first problem. Defeating the current defenses would be another. Let’s take a look at the current Order of Battle for both sides. Given the vast increases in British defense resources in the Falklands since 1982, any Argentine attempt to seize the islands would have to take a much different approach than the 1982 amphibious invasion, and would be a much wider scale operation, with much greater risks. Argentina no longer has a credible ability to deploy more than a single battalion of expeditionary forces. Facing a reinforced rifle company in the defense with such a small force is just within the realm of feasibility, but facing one with air superiority over its own territory would be futile. Argentina could land a token force of special operations somewhere in the Falklands to “show the flag” for domestic political consumption. Such a force could be landed by fishing vessel, or conceivably by Argentine submarine. Such a force would likely not be able to maintain station on the islands for more than 48 hours before British forces hunted them down. Since such a mission would be strictly for domestic purposes, the capture or destruction of such a team would be highly counterproductive, and great pains would be taken to plan for the retrieval of the team. Other options short of an outright invasion are open to Argentina. Harassment of fishing vessels in Falklands waters, denial of landing rights to civil aviation from the Falklands (or even Great Britain), denial of port entry to ships making landfall in the Falklands are all options. Other than being about 300 miles from Argentina, the Falklands are in the middle of nowhere, and some level of outside trade is critical. Actions by Argentina that are short of outright combat can persuade some commercial interests that it isn’t worth it to trade with the remote outpost. We can expect Argentina to continue to do as much as possible to make the Falklands as expensive an outpost of Great Britain as they can, in hopes of reducing British support for the Falklanders continual claim to be under the protection of the Crown. Should Argentina seriously try to seize actual control of the islands, they would first have to seize control of the air. The only way to do this would be to attack RAF Mt. Pleasant, and render its runways inoperative, at least for a few days. With any strategic warning at all, Great Britain could reinforce the standing force of four fighters with fairly large numbers of fighters, strike aircraft, and tankers. With that in mind, Argentina would have to strike “out of the blue.” A mass raid by as much of the A-4AR fleet as can be made operational would have a fair chance of success of damaging both runways. But if RAF Mt. Pleasant has as little as five minutes warning of the incoming raid, Argentine losses would be very heavy, both from ready alert Typhoons and Rapier surface to air missiles. Let’s assume that such an Argentine raid has been successful. While denying Great Britain use of its airpower (at least temporarily) is a condition for any chance of success, such a raid would certainly alert ground forces to a possible landing. Rehearsed plans to defeat any Argentine landings would be initiated. Whether Britain would attempt to defeat such a landing on the beaches or inland is an open question. Any Argentine landing would have as its prime objective to seize RAF Mt. Pleasant. Failure to do so would give Britain time to repair any damage, and potentially allow reinforcements to flow in via an air bridge. To defeat the British Army garrison quickly, the Argentines would need to land more than one battalion of their own Marines. But they lack the amphibious shipping to do so. They would have to press into service merchant vessels, themselves ill suited to serve as troopships. Worse, this procurement would have to take place prior to any hostilities. Such an action could very easily come to the attention of Britain, and serve as strategic warning of an impending attack. Indeed, an large scale preparations by the ARA to ready more than a usual number of ships for sea is likely to attract British attention, and lead to reinforcing the islands. But let’s assume, for the purpose of our discussion, that Argentina somehow manages to both suppress RAF Mt. Pleasant, land two or more battalions on the Falklands, and seize RAF Mt. Pleasant, and destroy or capture the garrison. What could Britain do in return? Much as Argentina would need to change its approach, with the absence of sea base airpower, and with a much smaller navy (and RAF, and army) Britain too would have to resort to different methods. We’ll take a look at some possible courses of action in our next installment. Argentina, struggling to keep its socialist economy afloat, has once again turned to an external distraction to keep the masses from looking too closely at the regime’s domestic record. For the last year or so, the government of Christina Kirchner has made noises about regaining control of the Falklands. For the most part, it’s just more political posturing. There will forever be a certain segment of the population there that will agitate for the Argentine flag to fly over the Falklands, no matter how little the inhabitants of the islands may wish it. But the discovery of possible oil and gas reserves in the waters around the islands has also made future earnings in the area tempting to Argentina. Britain has for the most part downplayed the tensions Argentina has attempted to incite. But the British are becoming annoyed, as, from their view, the matter was conclusively settled in 1982. Mind you, Britain has no great desire to hold onto the islands, even with potential energy reserves there. It is a net drain for them to support the islands and maintain a garrison there. But having spent fortune and shed blood to regain the islands, the very last thing Britain will do is succumb to Argentine diplomatic pressure to cede the islands. The islands will shortly hold another referendum on British rule, in which they will almost certainly reiterate their loyalty to the Crown. As a matter of international law and the UN charter, that should be that. And as a practical matter, of course, Argentina’s failure to maintain control after seizing them means their claim is illegitimate. Your territorial integrity claims are only as legitimate as you can enforce them. I’ve written a bit about the naval aspect of the Falklands War of 1982 here on the blog (a kindle version of the series is available HERE for the low price of $0.99) and the challenges both Argentina and Britain faced in that battle. Should the Argentinians attempt to again seize the Falklands by force of arms, the scenario for both sides would be radically different. For one thing, Britain no longer has any Harriers to deploy aboard carriers, and as such securing air superiority would be a much greater challenge. On the other hand, Britain has a much more robust land attack capability at sea these days via Tomahawk Land Attack Missiles. And should Argentina attack again, I think Britain would be wise to make its opening salvo in reply an attack on the Argentine mainland, specifically, sending a TLAM through the front door of the Casa Rosada. If there’s a bit of interest, I can describe some possible courses of action both sides might take should it come to a shooting war again. The naval battle for the Falklands was a surprisingly savage war, pitting two near-peer powers against each other. Virtually every weapon of modern naval warfare was employed- ships, submarines, aircraft carriers, anti-ship missiles and anti-aircraft missiles, and amphibious warfare. As best as I can recall, the US Navy hasn’t lost a single warship since the Korean War. The naval war in the Falklands provided our Navy with a significant number of lessons to digest, from anti-aircraft operations at sea and in the littorals, to damage control training. Current US Navy doctrine and shipbuilding programs are focused on fighting in the littorals, that is, the narrow band of water near the shores of land. These waters, with their restricted room for maneuvers and cluttered environment, pose challenges that blue water operations don’t. Understanding the lessons of the naval war in the Falklands can provide clues as to challenges the Navy will face in the littorals. War- On April 2nd, 1982, forces from Argentina staged an amphibious invasion of the Falklands Islands in the South Atlantic, approximately 300 miles east of the Argentine coastline. The Falklands had long been a bone of contention between Argentina and Great Britain. Talks had been underway to arrange a transfer of sovereignty from Great Britain to Argentina, but had hit a deadlock over one major sticking point- the 2000 residents of the islands thought of themselves as Britons, and had absolutely no desire to become Argentinian. The Argentinian government, a military junta, intended the invasion more as a diplomatic maneuver than a military expedition. Incredibly, they thought the invasion would present the British with a fait acompli, giving the Thatcher government justification to write off the islands. The junta was stunned by Margaret Thatcher’s immediate announcement of Britain’s intent to form a task force and retake the islands by force of arms if necessary. Britain quickly assembled and sortied a large naval task force centered around two light carriers, the Invincible and the Hermes, armed with Harrier jump jets and Sea King helicopters. The task force also had anti-air destroyers and anti-sub frigates, as well as a large number of amphibious warfare ships and merchant ships pressed into service with the task force. This task force was intended to secure control of the air and waters surrounding the Falklands, and land an amphibious force to defeat or eject Argentinian forces from the islands, reinstating British control of the islands. Each side faced challenges they were only imperfectly prepared to meet. For the Argentinians, the challenge was to maintain sea and air communications with the Falklands in the face of determined opposition by a modern navy equipped with aircraft carriers and nuclear submarines. For the British, the challenge was to deploy and sustain a carrier and amphibious task force 8000 miles from home, and operate in waters the enemy could cover with land based airpower.